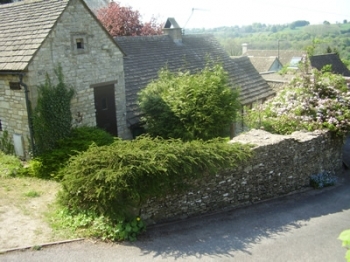 Two Pillars is a picturesque old stone cottage on the village green in the centre of the pretty Cotswold village of Eastcombe overlooking the Toadsmoor Valley. The cottage has one double bedroom with adjoining bathroom. There is a kitchen with a cooker, fridge, microwave, dish washer, washing machine and separate dining area. The living room has an open log fire and sliding glass doors to a secluded courtyard garden. There is a television with DVD and video. WiFi broadband. Gas central heating. The village shop with freshly baked bread is just across the green. The village pub, the Lamb Inn, with good food is nearby. Well behaved dogs welcome. The cottage is available all year round, including winter weekends and short breaks.